Christopher Columbus was born on October 31, 1441 in Genoa, Italy. Christopher embarked on his first ship when he was just fourteen years old. After settling on the island of Madeira, Columbus soon began hearing rumors of the New World. Before long, Christopher decided that he wanted to take an expedition himself, but lacked the money. Eventually, King Ferdinand and Queen Isabella elected to finance the journey. They were hoping that great riches could be found. Isabella became so supportive that she sold some of her most precious jewels to finance the trip. At the time, the Spanish had been engaged in numerous conflicts and the costs associated with war had placed the government under intense financial pressure. The monarchy hoped to strike it rich in newly conquered lands. Columbus obtained three caravels, the Nina, the Pinta, and the Santa Maria. All three were about the same size. They were all approximately eighty feet in length and twenty five feet in width. Columbus left on August 3, 1492. He believed that they would arrive somewhere in Asia. However, after traveling more than three thousand miles the crew began to give up. Then suddenly, on October 12, 1492, and they sighted and island that Columbus named El Salvador. This discovery was followed by the discovery of the island of Cuba on October 28, and Haiti and the Dominican Republic on December 5th. Then on Christmas night the Santa Maria was wrecked on a sandbar. Columbus was forced to leave behind approximately forty men in the Dominican Republic. Before he left, they constructed, La Navidad, the first Spanish settlement in the New World. Once back in Spain, Columbus was greeted by King Ferdinand and Queen Isabella. 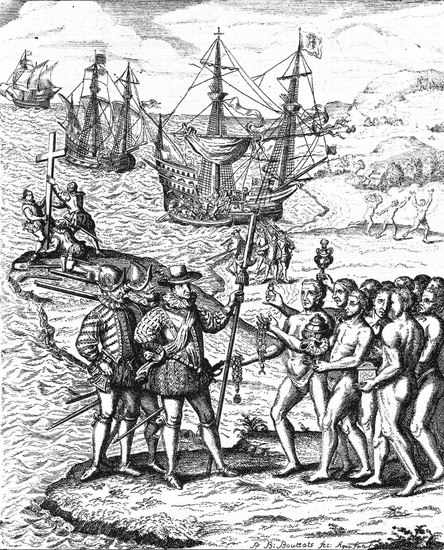 Walking in front of Columbus was entourage of a half-dozen indigenous people from the New World. They dazzled the Spanish royalty by wearing huge gold ornaments and carrying spears and arrows. Columbus also brought with him forty beautiful parrots, and a five foot iguana. Columbus would make three more voyages. The second lasted from September, 1493 to March, 1496. He would return to La Navidad and find that all of the men had perished, killed by the local natives. Next, he would then discover Puerto Rico and Jamaica. On April 8, 1494, Antonio de Torres, one of Columbus's captains, would return to Spain with the first slaves from the New World. Columbus claimed they were cannibals, and they may have been. A year later in February 1495, Torres would again return to Castille, Spain with 500 more slaves. Before long, slave ships would shift away the sights away from Africa and instead focus of the New World. Island after island was wiped clean of its inhabitants. The third voyage lasted from January. 1498 to October, 1500 AD. On this voyage Columbus would finally discover the mainland of the America's or Tierra Firme (firm ground) as it would soon be known. Here he would realize that he had discovered an enormous continent. The fourth voyage would make contact with the Mayans. Near the island of Guanaja off the coast of northern Honduras he encountered a canoe carrying traders who told the Spaniards that they were Maia or Maiam. It is from these names that the word Maya evolved. Columbus died on May 20, 1506 in Valladoid, Spain. Upon his death he held the titles of Viceroy of the Indies, and Admiral of the Ocean.